Ylang Ylang Beach Resort becomes #1 destination for Costa Rica weddings, known as one of the best beach resorts for getting married in Montezuma Costa Rica. The Ylang Ylang Beach Resort and Spa is the premiere property and wedding venue for Costa Rica weddings. This unspoiled jungle paradise situated right on the beach is the perfect place to get married in Costa Rica, located in Montezuma. It’s unparalleled natural beauty, restful atmosphere all arranged where the heart of the jungle meets the white sands beaches of the blue-green ocean. You can find out more about weddings in Costa Rica at their brand new multi-language website just launched.. If you’re wondering, “Can I get married in Costa Rica?” The answer is “of course!” The knowledgeable staff at the Ylang Ylang have been planning Costa Rica weddings for decades. Not only will they answer all your questions and cater to your every whim, they’ll be sure to let you know all the paperwork you need to bring. The Ylang Ylang Beach Resort provides full service wedding packages for every taste and budget. Everything you need is available including the minister, photographer, florist, hair dresser, entertainment and much much more. Of course no wedding would be complete without food. The sumptuous wedding buffets at the Ylang Ylang include local fresh fish and chicken, a myriad of organic vegetables and desserts made on the premises, this incredible prepared food is prepared fresh and served elegantly to your wedding party. Ylang Ylang provides an idyllic setting for your nuptials. Many couples come from Canada, the United States and Great Britain to be married in Cost Rica. Thea and Ryan from Alberta, Canada were married at the Ylang Ylang on February 13 of this year. Thirty-two friends and family members came along to celebrate with them. They chose a wedding package that included a champagne toast for the bride as she and her bridesmaids had their hair primped by a local hairdresser. Their flowers included beautiful tropical bouquets, boutonnieres, floral crowns and table center pieces. 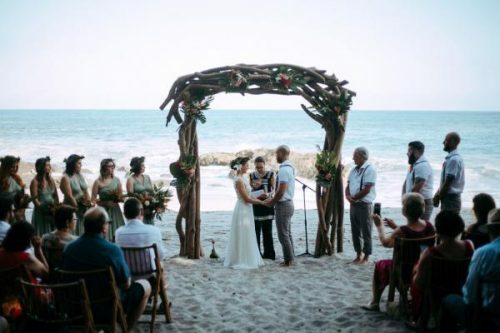 Their ceremony was held at the beach with the bride and groom beneath a driftwood arch also adorned with tropical flowers. Ylang Ylang also provided the ordained minister for the ceremony. This was followed by many congratulations at the cocktail hour with open bar, appetizers and music. Thea and Ryan’s buffet wedding feast culminated with a two-layer carrot caress cake. The DJ kept all the guests dancing during the reception and the evening ended with family and friends in front of a large beach bonfire. There are plenty of rooms, bungalows and private guest quarters at the resort to choose from for you and your guests for the wedding and honeymoon. If you’re thinking about getting married in Costa Rica, the Ylang Ylang will provide you with a full service package for the biggest and best day of your life. The Ylang Ylang Beach Resort has been a family-owned and operated business for two generations. The resort opened in 2004 when the Iacono family renamed their pristine beach front property Ylang Ylang. The Iaconos have created a treasured, green sanctuary that’s visited by travelers from all over the globe.To learn more about this stunning, self-sustaining property visit, https://www.ylangylangbeachresort.com/.